I thought a little update on the bookcase project was in order. I need to get this completed soon to make way both for the coffee table project and to get the piece into the house in time for for my in-laws, who are due to visit next weekend. We have a few boxes of books waiting in the wings, and I’m holding things up with my dawdling. I’ve been putting in some steady time, just not full time as I’ve been doing a bunch of CAD and fiddling around with machinery for the past few days. This coming week I hope to put a more concentrated burst of work in on the piece. Next up were the connections between the top of the carcase and the sides. I considered lots of different possibilities as far as the joints were concerned, limited in some respects by the assembly direction already established by the through-tenoned shelves and the direction they must slide into place. 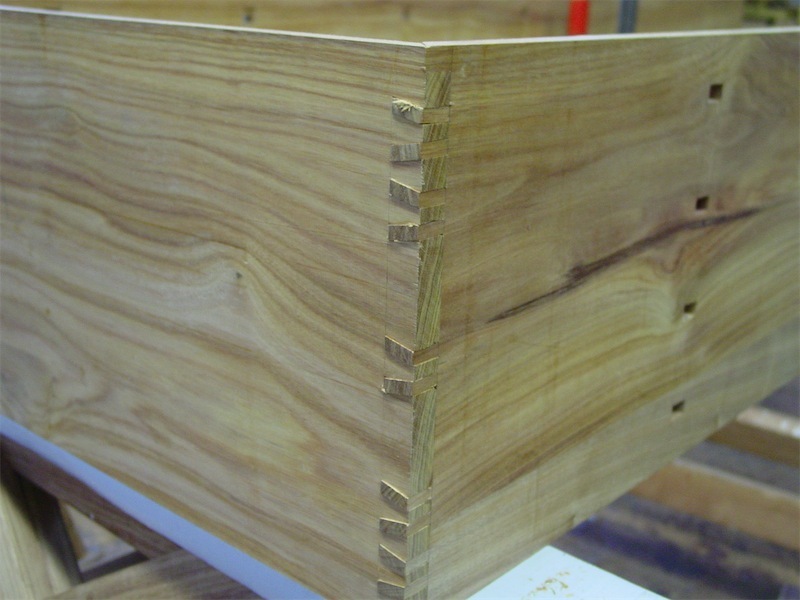 These kind of look like dovetails, however I suspect most readers will find, as they read further, that these joints are not quite what they might be expecting. It might look like a major blunder has been committed in the above photo – have I cut on the wrong side of the lines? The Japanese call this joint pattern momo-gata (股形), which basically refers to having one’s knees apart, the thighs forming a vee to one another. Yes, a delicate way of saying crotch. I hadn’t cut this form of joint before, so I took the opportunity to play around with it in this piece. When the scribing was complete (I used a razor blade, BTW), I cut out the tenons on both ends of that top board in much the same manner as I had done on the side boards. Then some paring and cleaning out was required. It was then ready for the test fit. I was happy with the fit, following as it did right after the cut out and given that it was the first time I had cut this form of joint. 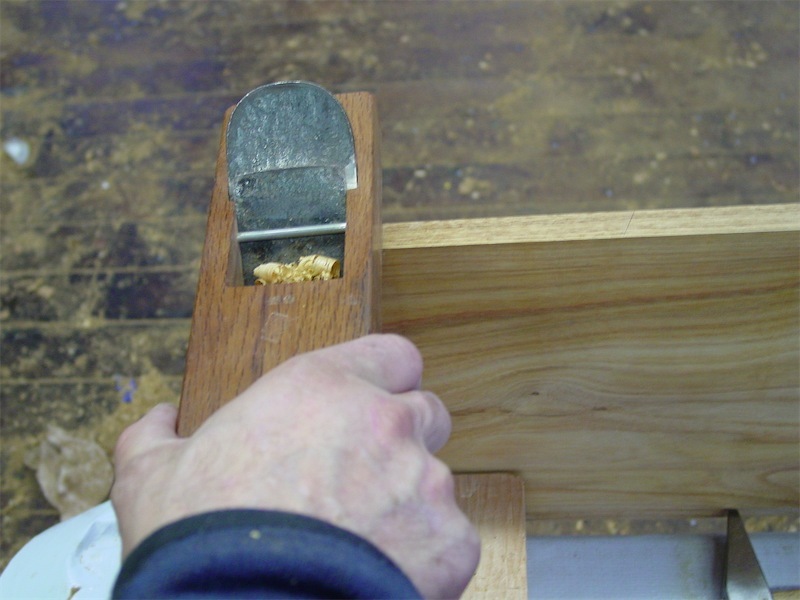 The fewer times one has to put together and take apart a joint to achieve the desired fit, the better. Can’t complain at all about how that went, except about the Canary wood which is prone to flaking, tastes gross if you get any dust in your mouth, and just plain smells skanky. 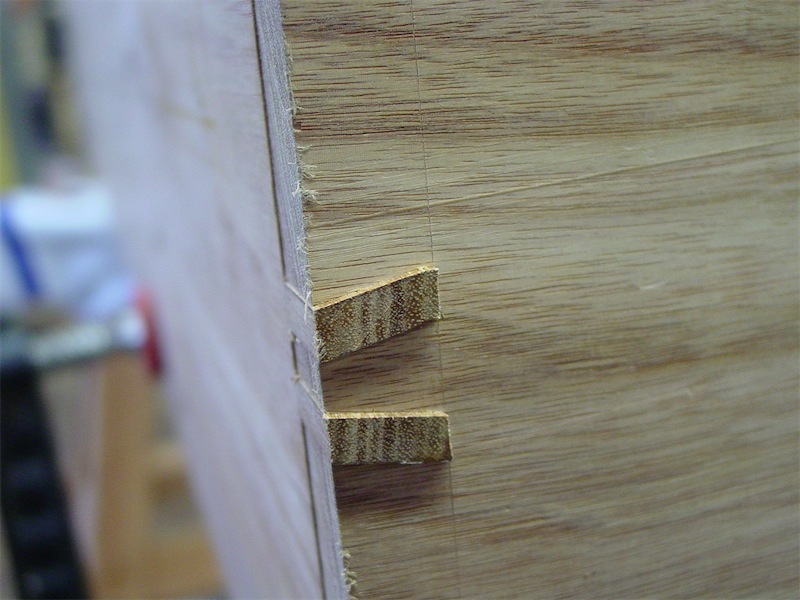 I like this pattern of joint, as it seems to combine the best of the finger joint and the dovetail. 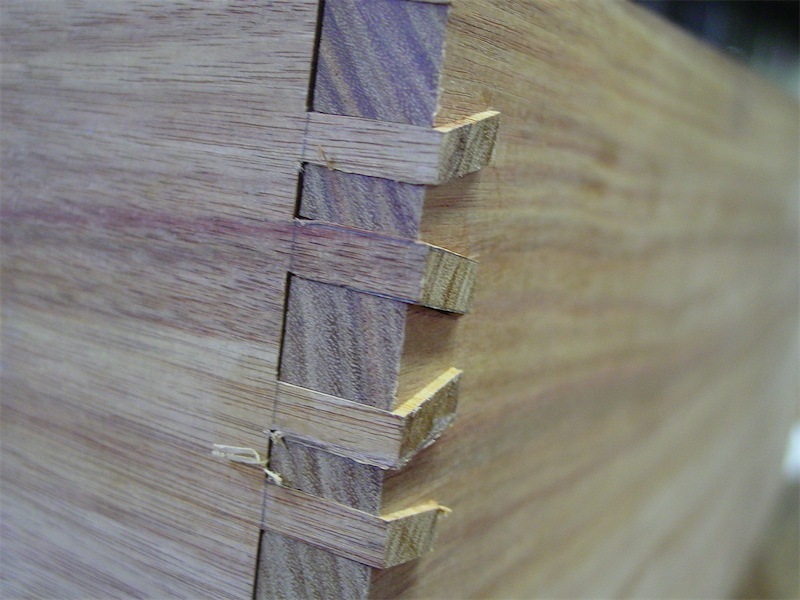 A little easier to cut and fit than dovetails, yet looking much the same when assembled and being every bit as mechanically sound. 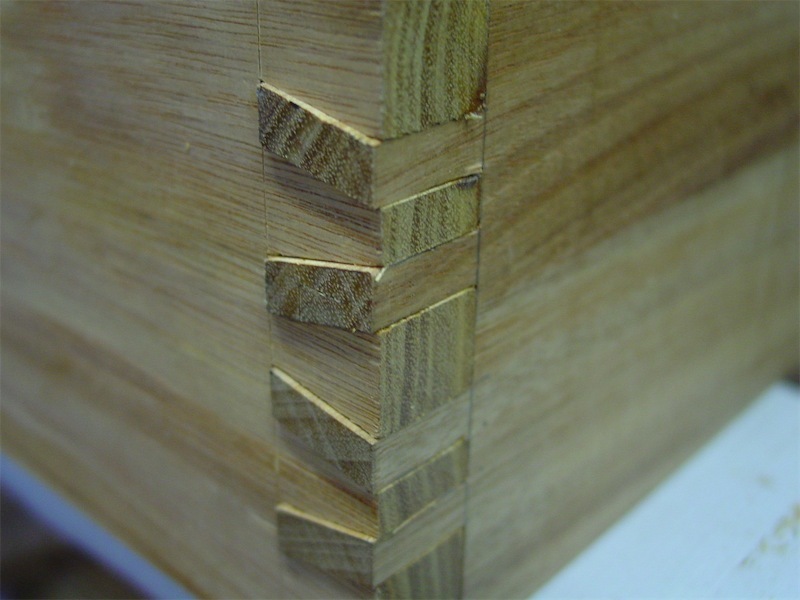 Like a carcase dovetail, it mechanically resists loads well in one direction, and requires glue. I’ll do these momo-pattern joints in a future piece. It might be worth exploring the cut out process using a table saw with a specially-ground blade if there were a lot to do. All for today. I should have the carcase of this bookcase together in another few hours of work, and then I can start in on the frame and panel back, which will be made from some bubinga left-overs. I won’t be gluing the shelves of the carcase in place, only the wedges which locks the multiple tenons – that will make the assembly process a fairly non-stressful affair I think. The momo-gata joints I will glue however. Minimal use of glue is a good thing I think. love the moma-gata joint! will have to try it myself, seems a nice break from the uniformity of a finger joint. as always, love the work you're doing! As usual, I love your work. I don't know about you but I often start a project that seems straight forward but as I get going, I think of different ways to improve the design. Rarely does it involve making things simpler or easier. Satisfying my design sensibilities often takes more time than I has originally alloted. Interesting cut angle on the tenon Kerfs. great to hear you like the momo gata joints. Have a go – I think you'll find them worthwhile. yep, same thing goes on for me. 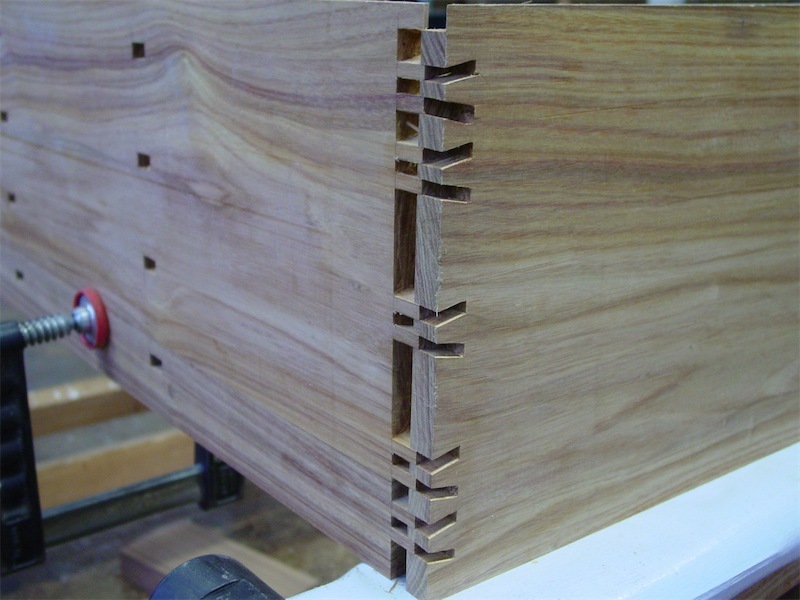 In the case of these corner joints at least, they aren't any more time consuming than most other options. 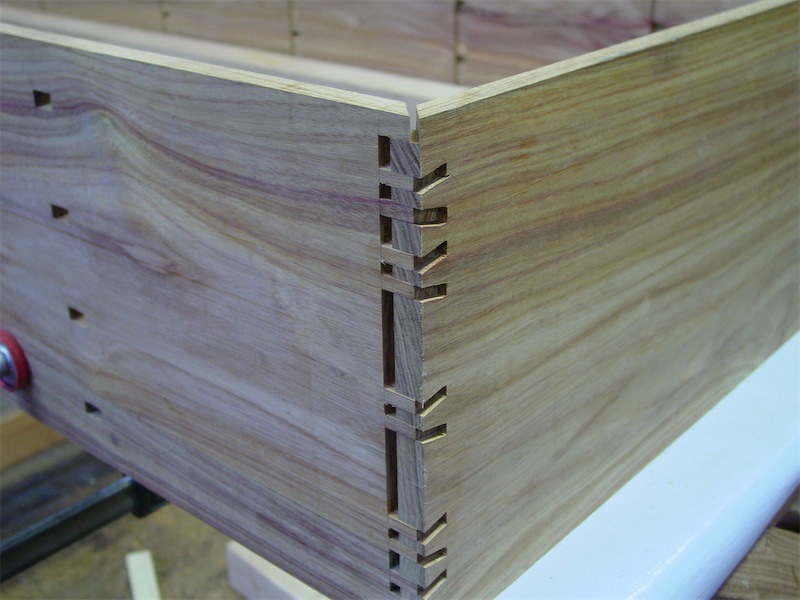 the angle of the kerfs is done to strengthen the root of the tenon section which splays to the side when the wedge is inserted. 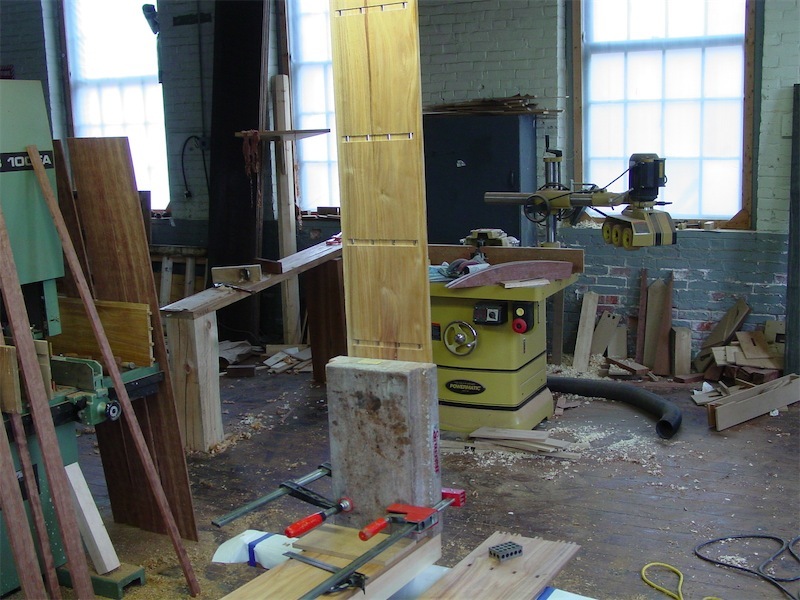 Also, as the kerf does not follow the grain, the chance of the inserted wedge precipitating a crack at the tenon, and beyond, is minimized. Hi Chris and per usual i love your work. I watch it all the time but don't comment that often. Momo gata joint i have seen a couple of time before and wondered why few people were doing it…That was understood some time ago when i have a go at it myself! Lets just the the joint worked and looked great from the other side of the woodshop. Thanks for the work to show so willing. thanks so much for your comment! Like any joint, the more times you cut it the better the results get. By far the biggest frustration for me in cutting this joint is the Canary Wood which is very easy to chip and flake when paring. I'm using it simply because I want to use it up and have nothing to do with it anymore.